Early registration for our University of California, Los Angeles life science marketing event is now available to lab suppliers interested in life science marketing opportunities and selling lab equipment in Los Angeles easily and economically. By purchasing through early registration, you get the most marketing value for your dollar. This is the perfect opportunity for lab suppliers working to increase their brand recognition and lab sales leads in an easy, affordable way. Early registration for our University of California, Los Angeles life science marketing event ends on January 3rd, 2014. The event will take place on April 3rd, 2014. One reason lab suppliers value the opportunity to register early for a show is that they receive all of the benefits other Biotechnology Calendar, Inc. exhibitors receive at a lower price. Accessible table layouts at each event ensure that attendees can find every lab supplier they are looking for. By registering early for an event, you are also guaranteed a table, even if the show sells out. Our University of California, Los Angeles show is one of our most popular events of the year, having attracted over 600 attendees in 2013. Although this event doesn’t take place until April 3rd, 2014, lab suppliers may miss the opportunity to exhibit if the event sells out in January, February or March. Why should lab suppliers exhibit at the University of California, Los Angeles specifically? One reason is that the university receives a wealth of research funding on a yearly basis. In 2012, the NIH awarded the University of California, Los Angeles $367.2 million in research funding. In addition to receiving a great deal of NIH funding, the University of California, Los Angeles also received $58.4 million from the NSF in 2012. For more funding information on UCLA, including a list of departments receiving NIH funding organized by department name, number of awards received and total funding awarded as well as the top NSF-funded life science project, please read our article Market Life Science Products at Research Powerhouse UCLA. If you are a lab supplier interested in life science marketing opportunities and selling lab products at University of California, Los Angeles life science marketing events, Biotechnology Calendar, Inc. invites you to attend our Los Angeles Biotechnology Vendor Showcase™ Event on April 3rd, 2014. 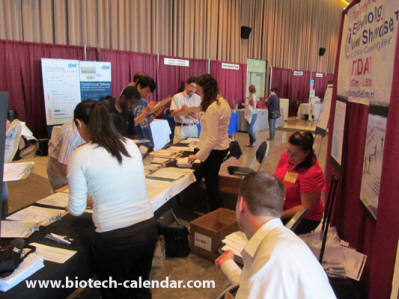 In 2013, the Los Angeles Biotechnology Vendor Showcase™ attracted 642 attendees. Of the attendees, 156 were purchasing agents, professors and post docs, and 86 were lab managers. The visitors came from 51 different research buildings and 87 departments across campus. Biotechnology Calendar, Inc. is a full-service science research marketing and events-planning company that organizes life science marketing events at top research universities across the nation. If you are interested in life science marketing opportunities or selling lab products at other life science marketing events closer to home, we encourage you to view our calendar. For more information on our Los Angeles Biotechnology Vendor Showcase™ Event, or to view more detailed funding statistics for the University of California, Los Angeles, click on the button below.